Life insurance, also commonly referred to as life assurance is not a subject many of us like to think about. We don’t like to think we are going to die but of course it is inevitable for us all, so in examining life insurance in Spain we are being very unselfish and thinking of others – our loved ones and what will happen to them. You may also find our related page on critical illness cover useful and helpful as is our main section on health insurance in Spain. Does Anyone Drive a Motorcycle? We will be back in touch shortly with the best quotation once we have processed your information. The legal/privacy bit we have to put in – Note that you are using this form to submit your details to us so we can then compare the market and give you options for life insurance. Our privacy notice at the footer of our website lets you know how we use your data and how to request removal. You don’t need to do anything other than fill in your details and let our brokers do the rest. A life insurance contract (or policy) is known in Spain as Seguros de Vida. You are known as the insured and the company you pay premiums to are known as the insurer. In return for these premiums upon your death the insurer gaurantees to pay your beneficiaries an agreed lump sum. This enables them to be looked after financially upon your death. A good life insurance policy (known in Spain as póliza) for Spain will help ease the financial burden for your relatives in the event of your death. Of course if you have few dependants or your relatives are able to support themselves financially then you don’t need to take out life cover. In this very critical and important decision you must also be aware that the contents of the policy are vital and you should not choose a policy on price alone. Picking the cheapest life insurance quote may save you money but surely will pay out less and give less benefits to those who you are setting the policy up for. Try going to a broker who will be able to compare quotations from many different providers of life insurance as this will potentially save you enormous amounts of time (as well as money) contacting each insurance company directly yourself. With life insurance having such important financial consequences, it is important to compare prices but in reality it is really the benefits as compared to the costs, that you really need to look at when making your decision. 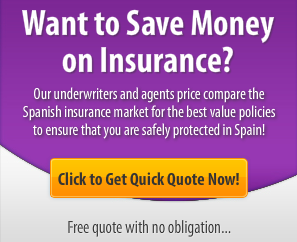 Why is Spanish Life Insurance So Important? The reality of life in Spain for most expatriates is that to survive financially most people need to start their own businesses as jobs and employment contracts are hard to come by and are typically very low paid with long working hours. If one of you were to pass away, could the business – and therefore the income continue? Another typical scenario for expats in Spain is that the husband or man is a tradesman such as builder or plumber. In this case should he die then clearly the wife or surviving partner would not be able to earn money and a living doing the same line of work. The key reason to take out life assurance is so that the income you provide for others is maintained. An adequate level of life insurance is designed to provide financial support for surviving dependants on the death of the policyholder. Being an expat and making a living in Spain is harder than many other countries and your dependants may not have the same financial skills, capabilities or qualifications as you. Would they be able to continue living in Spain or would they need to return to their home country if you were not providing the main source of income for your family? Any outstanding debts you have will also most likely be paid off in full, these include probably your biggest debt – your mortgage but also any credit card debts and other loans. If you have a partner, family or business partner who would suffer financially when you die then consider life insurance to clear your obligations, debts and to provide a cash lump sum to alleviate any possible financial distress. Life assurance can pay for your funeral expenses in Spain or cremation costs, perhaps you wish to be buried in another country other than Spain, this will incur a considerable expense at the worst possible time for your relatives, spouse or children. Now you have decided life insurance is worth considering, let us look at the two main types of life insurance for Spain. This is the most basic level of cover available i.e. the cheapest. Most people take out term life insurance. Under a term life policy there is a pay out should the policy holder die. Annual premiums are paid for a fixed length of time. Once this fixed length of time runs out or expires then the policy is over and nothing is paid out. Most term life policies will lock you in for a block period of five or ten years. It might look suspicious if you just wanted to take out a policy for a short time such as a year! This type of life assurance is useful in the short-term. Maybe you anticipate reaching pensionable age in which case your financial obligations will change and a regular income will be guaranteed then. Perhaps you need term life assurance because your children are in the private school system in Spain and at a certain age this will no longer be necessary therefore dramatically lowering your outgoings. Also they will then be able to find work and employment themselves then and so will be able to support themselves. This is also known as permanent life insurance and is a life insurance policy that continues right the way through the policyholder’s life meaning a payout is certain to happen. Because of this naturally the premiums are higher than those on term life policies. Clearly a whole life policy is a major financial commitment as there is no point paying annual premiums for many years and then not being able to keep up the payments and thereby losing your cover. We recognise that many of the terms used in the Spanish life industry can be confusing to the average person so we have a list of definitions and explanations of life insurance terms at the bottom of this page. What Type of Cover is Best For Me? This is a question that only you can answer depending on your own unique, individual circumstances. Firstly consider the alternative to life assurance – saving yourself. This does of course require tremendous self-disciple but the principle is sound. You could save a lump sum in the event of of death. This could be in the form of a bank account paying interest or you could invest a proportion into stocks and shares to potentially provide a higher return. The benefit of taking out a life insurance policy is that it makes you commit to the policy whereas if you have money in a bank account it can often be spent whenever a financial demand comes up or you sucumb to temptation! Do take into consideration your language skills. If you are not fluent in Spanish then it is important to take out life insurance with policy documents issued in English. Otherwise you won’t fully understand what you are covered for. Don’t take the agent or brokers verbal explanation as when it comes to claiming on your life insurance you will be the one footing the bill if you find you are not properly covered. So check the small print and ask questions until you are 100% sure the policy if what you want. Be careful not to nullify your contact or policy. The premiums you pay towards your life insurance can be considerable so it would be silly to void your contact. This can happen if the insured commits suicide, most life companies will consider that you took the policy out in order to collect on the life insurance policy. Another reason could be if you are considered to have lied or made false statements on your original application, this is most relevant when it comes to your health and the answers you have given about the state of your health and medical condition. It is best to be honest when you make your application. Also be careful to keep up your payments as if you fail to pay or get behind your policy will become invalid. Although life insurance is not compulsory by law it is common for most banks and mortgage lenders to insist you take out a policy to protect their loan in the event of your death. Medicals are necessary in many cases. These are dependent on age and the amount of cover required although the cost of the medical is paid by the insurer. Life insurance companies usually have a one or two year exclusion for suicide to try to prevent people taking out insurance with this intention in mind. Assured – Those insured under the terms of an insurance policy. Benefit – The money paid to the policyholder when a claim is made. Bid Price – The selling price or cash-in value of your unit holdings. Bonus – Relates to a with-profits policy. The amount of money added to the benefit payable under the policy. The amount is dependent upon the profits made by the insurance company. Added bonuses cannot be taken away. Convertible Term Assurance – A term insurance policy which gives you the option to convert your current policy to a whole-life or endowment insurance policy, without having to take further medical examinations. Critical Illness Insurance – A policy that pays out a lump sum on the diagnosis of life threatening illnesses indicated in the terms of the plan. Decreasing Term – A form of term life insurance where the death benefit decreases each year as per your policy. Premiums remain level. This type of certificate is frequently sold as mortgage insurance. There is no surrender value for this policy. Endowment Insurance – An insurance policy that pays a stated amount at the end of a specified period or upon the death of the insured if it occurs within that period. Family Income Benefit – Term assurance which pays money to the life assured’s dependants for a set period, rather than paying a lump sum. Guaranteed Bond – A bond in which principal and interest are guaranteed by an entity other than the issuer. Guaranteed Bonds can be income or growth. Increasing Term – The cover and the amount you pay into the policy are increased by a specific percentage each year calculated on the original sum insured. Designed as a way to increase your life cover as your earnings increase. Investment Bond – Combines investment with some life cover. The payments you make into an insurance policy or investment bond, usually a lump sum, are invested in the insurance company’s with-profits or unit-linked funds (Life Funds). Different types of bonds include the guaranteed bond and unit-linked single premium bond. Not to be confused with a company or government bond, an investment that offers a fixed rate of interest and an area where your chosen Life Funds may be invested. Life Fund – This usually refers to Unit linked Investment Funds. These are funds run by Life Assurance or Pension Companies. Such funds are used for individuals holding life assurance policies to invest in. The assets held within the fund are divided into a number of units. When an investor contributes to a Life Fund, units are allocated to investors in proportion to their investment. Maturity – An agreed date when an endowment policy ends and the proceeds, including any bonuses, are payable. Mutual – A life insurance company that is owned by its with-profits policyholders. Offer Price – The price at which fund units are bought. Premium – The amount of money paid into an insurance policy. Proprietary – A life insurance company that issues its profits to its shareholders. Qualifying Policy – A life assurance based savings plan that has to be written for a minimum of 10 years and must fulfil certain qualifying policy criteria to ensure the final payout is tax free. Renewable Term – Term Insurance that may be renewed for another term without evidence of insurability. Single Premium Policy – Where a single lump sum is paid for an insurance policy. Sum Insured – The amount of money that is guaranteed to be paid under an insurance policy, before any bonuses are added. Term Insurance – Provides policyholder with protection only. Life insurance payable to a beneficiary only when an insured dies within a specified number of years (the term). If you live beyond the term you do not receive any payment. This is thought to be the cheapest type of insurance. Terminal Bonus – This is an extra bonus determined when a death or maturity claim is paid. Terminal bonus is often only paid if the policy has been in-force for a minimum number of years at claim time. The amount is dependent upon the profits made by the insurance company. Unitised With Profits Fund – Also known as a Unit-Linked With Profits Fund. A type of Life Fund that can invest in UK and overseas shares, property, fixed interest securities and cash. When you invest in this fund through an insurance policy, you buy ‘units’. When an annual bonus is declared, you can either receive more units or it is added to the unit price on a daily basis. Due to the addition of bonuses the unit price does not reflect the value of the underlying investments. Unit-Linked – Also called Unitised. If your insurance policy is unit-linked, some of your money is used to purchase ‘units’ in a fund. The value of your policy at maturity is dependent upon the growth of the fund in which the policy is invested. Generally refers to policies that offer protection and saving such as endowment insurance, whole life insurance and investment bonds. Unit-Linked Single Premium Bond – A single lump sum life insurance policy where your investment is spread over a number of Life Funds. Whole Life Insurance – Whole life insurance provides a death benefit for the policyholder as it builds up cash value. The policy remains in force for the lifetime of the insured, as long as premiums are paid according to the policy agreement. You can choose insurance that pays out on death a guaranteed sum only, the sum plus any bonuses that have been added, or the sum plus any additional value from the growth of the funds invested in. Without Profits – When a policy reaches maturity or the policyholder dies, the amount paid out is the basic guaranteed sum only. You would not be entitled to any bonuses. With Profits – Relates to insurance policies that combine investment with protection. This type of policy is entitled to a share of the profits made by the insurance company. Premiums are invested in the with profit fund, reversionary bonuses are applied usually on an annual basis which reflect the investment growth of the fund assets. On death and/or maturity a further terminal bonus might be applied to the fund value. With Profits Bond – An insurance policy where your lump sum is in most cases invested in a Unitised With Profits Fund (which is listed under the Life Funds section).